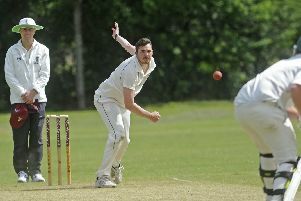 Ben White claimed a first-ever hat-trick to send Fareham & Crofton to the top of Hampshire League division one with a 21-run win against Ropley at Bath Lane on Saturday. White made his dramatic impact just as the visitors were threatening to overhaul his side’s 308 for nine. He reeled off two wickets in two balls before waiting until the first ball of his next over to complete the hat-trick. All three victims were clean bowled middle stump as Fareham & Crofton got back on track after their first defeat the previous week. White said: ‘There were good individual performances and we also did well collectively as a team. ‘It moves us to top of the table and that is a great place to be. 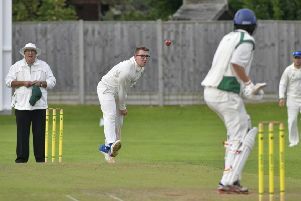 Batting first, James Heiniger (83) and Dan Wimble – with 75 off 53 balls – led the recovery after the loss of an early wicket. Luke Cornish and Chris Davey then added some important lower order runs. Wimble also had the satisfaction of removing former Hampshire all-rounder Shaun Udal early in the Ropley innings. James Hedon took the vital wicket of the visitors’ dangerous overseas player. White then removed any doubt with his hat-trick heroics. It was a case of so near and yet so far for winless United Services. Captain Matt Easton (47 not out) was left stranded as his side fell four runs short of victory against Hursley Park at Burnaby Road. ‘We needed 11 off the final over and got five off the first two balls,’ he said. ‘Unfortunately I was stranded at the other end and we couldn’t quite get over the line. Fourteen-year-old Freddie Gadd (three for 20) and Easton (three for 37) had earlier bowled well as Hursley posted 197 for nine. John Brazier, Tom May, Gadd and Gary Hounsome helped Services get close.